This tool holder is similar to our Magic Holder, but features the added convenience of a sliding rail. The unique design of this product allows you to keep all of your tools within reach, but also allows you to quickly stow them away when not in use. It is perfect for that little area between the fridge and the wall, inside of a closet door, next to your dryer in the laundry room, or anywhere else that you would like to neatly store mops, brooms and other tools. Use it in your home, outside in the garage, in a tool shed, down in the basement and more. It can be mounted to slide out in either direction, so placement is a breeze, and compatibility is not an issue. This amazing tool holder can hold up to 9 different items thanks to the 5 slots and 4 integrated hooks. Discover how convenient it is to slide out the rack when you need something, and then slide it back, out of sight, when you are done. All of your tools will remain neatly organized and out of the way unless you need them. It works on any tool with a handle, and is great for cleaning tools, gardening tools and even sports equipment too. Mount the Store ' N Slide in narrow and hard to reach places. It will allow you to straighten up your storage, and keep more tools in a small amount of space. You will have a high quality storage rack that can be easily hidden out of the way when not in use. Cam-action rubber rollers grip the handles tight while gravity keeps them in place. Just place a handle in the slot and let it fall. The Store 'N Slide will automatically adjust for thickness and grip the handle tightly. It will remain in place, securely until you remove it by lifting upwards. It holds virtually any tool with a handle, and adjusts to accommodate thicknesses from 3/4" to 1-1/4" in diameter. It comes complete with a mounting template and all the hardware you need for quick and easy installation. The Store 'N Slide features a no-rust nylon housing and commercial-grade ball-bearing steel rails. 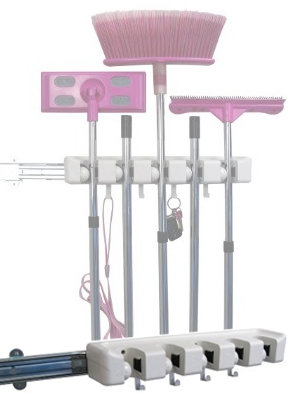 It is the easiest way to organize and store your shovels, rakes, mops, brooms, baseball bats, tennis rackets and more. Basically if it fits in the slot, the Store 'N Slide will hold it. Hang all of your tools neatly together, and then slide them back into the perfect storage spot when not in use. Once mounted using the included template and hardware, operation is easy: The wall-mounted Store ' N Slide grips handles fast, holding each tool safely with a secure and steady grip. Just insert a handle into a slot and the rounded, gravity-controlled cylinder automatically adjusts to it, locking securely. To remove, simply lift handle up slightly with one hand. Sliding it back and forth is a quick and easy operation thanks to the integrated metal rail and advanced design. Simply pull straight out to access your tools, and then slide straight back when finished. Order Yours Today! Dimensions 3" x 17.5" x 3.5"
Store 'N Slide Tool Holder - An easy way to keep all of your tools organized. The unique sliding rail design allows you to store tools in tight places, inside closets doors, or just provide fast and easy access to all of your tools. Easily hang or remove virtually any cleaning tool with a pole, gardening tools, sports equipment and more. The four hooks are too flimsy and in too tight space to hang anything from. Other than that I love the product. This is a good product. Works as promised. Easy to use. Unique Elastic Ties With Hundreds of Uses. Four Bags In One! Environmentally Friendly Grocery Shopping Made Easy.